Not on his bike, you understand, although it would be totally forgivable – those time trial bikes are too damn narrow. They should do time trials on shopping bikes and Raleigh Choppers to keep everyone safe. No, what I actually mean with that title is that Froome’s Vuelta ambitions look a bit shaky after yesterday’s time trial. If he was going to win the Vuelta, it was presumed that Froomedog would have yapped his way round the time trial course quicker than anyone. He didn’t. He finished third. Contador beat him and Rodriguez is still ahead of him in the general classification, having already proved himself the better climber on steep gradients. Some riders get stronger as a Grand Tour wears on, but Froome’s had a long season. Personally, I had hoped that his inability to dominate in the first week was down to fast, steep finishes favouring lighter riders, but the time trial has perhaps exposed him. There was an unpleasant lump in the middle that would have made you or I vomit, but it wasn’t too steep for the pros and so you’d expect the most consistently powerful rider to win the stage, rather than the one with the best power-to-weight ratio. Froome needed to be the most powerful rider, because he’s the heaviest of the four main contenders. On yesterday’s evidence, Contador is more powerful AND lighter. Things could get ugly. 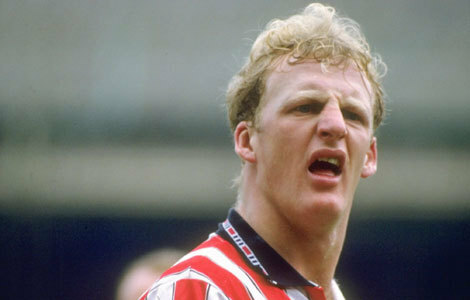 When things get ugly in an uphill bike race, they get Iain Dowie ugly. Joaquim (or possibly ‘Joaquin’ – there doesn’t seem to be much consensus) Rodriguez can be pretty happy though. His plan was to stay within seconds of the leader so that he could start chipping away again after the time trial. As it turns out, he’s still the leader. The one second margin over Contador isn’t entirely comfortable, but it’s better than he would have expected. It’s also a short, steep uphill finish today that should suit him. It wouldn’t suit me. I just watched a video of it and now my quadriceps hurt.